It comes as a sobering discovery to those of us of a certain age to realise that the first television broadcast of Dad’s Army was over fifty years ago. Frequent repeats of the nine series produced have exposed successive generations to this classic sitcom. It still has the power to amuse to a not insignificant extent owing to character recognition, even if scripts are now a little dated. Given the accessibility of original transmissions, a theatrical version of three episodes presented as if in live recording for radio by just two actors seems a strange concept. However the outcome is extraordinarily successful. Dressed in military fatigues, David Benson and Jack Lane between them manage to play over 25 characters with uncanny accuracy. In addition, pacey direction by Owen Lewis ensures that any questions about script quality are lost in performances demanding dialogue not just between actors but between characters (male and female) portrayed by the same individual actor. One curious effect of this is the enjoyment to be found not just in admiration of the vocal pyrotechnics but creation of a mental picture of the situations characters find themselves in. Thus on a macro level, it becomes possible to imagine Corporal Jones’ delivery van pursued by an explosive laden giant Catherine wheel. At the other micro extreme, Lane’s portrayal of Captain Mainwaring in his encounters with Benson’s Mrs Fiona Gray are especially poignant given the audience’s awareness of Mainwaring’s obliquely acknowledged less than happy marriage. Familiarity is another important element in the success of this production. When Mainwaring delivers the immortal words “Don’t tell him, Pike” a cheer erupted from the audience. Another example of this is seen through Tom Lishman’s very slick sound design, in the fractionally late stamp of Corporal Jones’ boot when the platoon is called to attention, achieving a recognition laugh on its first appearance. This sound design extended to a number of subtle effects which reinforced the illusion of live radio recording. However the fiction of audience involvement in a live Radio Recording was not allowed to obscure the fact that this was ultimately a theatrical performance, with several slick ad libs breaking the fourth wall. The audience were as familiar with characters and situations to an extent not far removed from pantomime, participation being encouraged with the familiar Bud Flanagan refrain employed in the opening credits. As with the original television series, audience identification and sympathy arises from an understanding that, regardless of various pomposities and engaging character flaws, every character has his or her heart in the right place. This theatrical treatment of Dad’s Army was delivered with obvious respect and affection for the original characters and performers. In summary, this was a thoroughly entertaining not to say heart-warming piece of theatre for a cold winter’s evening. 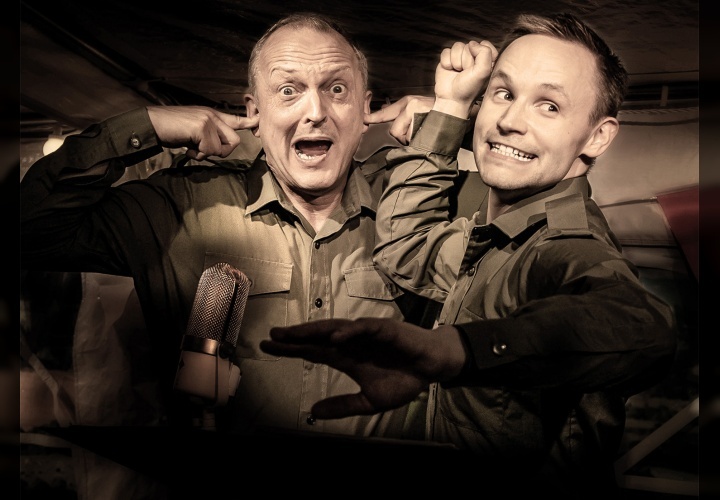 Dad’s Army Radio Show is playing at Wilton’s Music Hall until the 26th January. For more information visit their website.